tourist destination in Portugal, defined by its Mediterranean climate. fluenced architecture, old-fashioned farms, and lively religious festivals. The sea reflects sunlight in every shade of blue, almost always calm and warm, with beaches of fine white sand. The beaches nestle between rocks in small bays amid the golden cliffs, providing stunning backdrops. The coastline allows for all kinds of water sports, including sailing and surfing. We will reside in a rustic boutique hotel, located near the village of Carrapateira, minutes from the amazing beaches of Amado and Bordeira. The property is set within large private grounds in the idyllic surroundings of the Coastal National Park Costa Vincentina. A comfortable hideaway to relax, practice yoga and meditation in a peaceful and natural atmosphere, providing rest and rejuvenation. Enjoy tennis, surfing, fishing, trekking, walking, and climbing in an unspoiled environment. 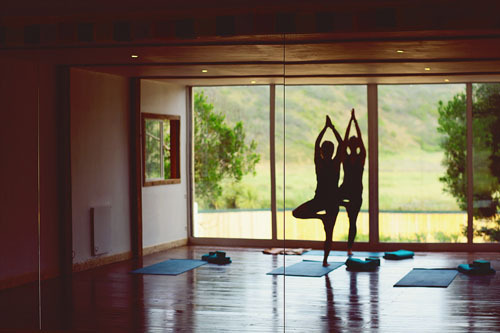 Affter morning yoga practice and breakfast, we may explore charming local villages and towns, browse, sightsee, find lunch in local restaurants, or simply delight in the pleasure of lovely beaches. Spa treatments are available. Buffet breakfast is included, with use of the swimming pool, tennis court, yoga room, and sauna. For lunch and dinner we visit local restaurants. The cost of this trip starts at $1,430. Cost includes your accommodation, double occupancy, (single supplement is available), breakfast and yoga instruction. Not included are lunch and dinner, spa services, transportation, and air fare. We will travel as a group or help participants arrange their own air transportation. Depart Chicago or the U.S. on Friday, June 22 to arrive in Faro on Saturday, June 23. The retreat ends on Saturday, June 30. Option for extended stay, early arrival: Not included are two overnight stays in Lisbon, June 21 and 22, (departing Chicago or the US on June 20). This will allow time to explore the city and its many options. And on June 23 we will take a train from Lisbon to Faro, (3.5 hours). Departure from Faro back to the US is on Saturday, June 30. Due to limited space, early registration is encouraged. For the EARLY ARRIVAL OPTION please add $200 to your selection. Enclose full amount, or a deposit of $440 per person, payable to the Chicago Yoga Center to reserve your space for Yoga in Portugal. Deposit of $440 is due with your registration form by February 23, 2018. Payment in full is due April 23, 2018. If you cancel your reservation in writing on or before February 23, 2018, we will refund all but $440. Cancellations made after February 23, 2018 cannot be refunded. Because our prepayments are not refundable, our cancellation policy must be firm. We strongly recommend that you buy travel insurance for the journey. All refunds will be remitted within 30 days. Yoga classes will be taught by Suddha Weixler, including meditation, and talks on the history of yoga and its philosophy. Suddha began studying yoga in 1978 on his first visit to India. He spent eight years in a monastic environment learning the classical system. Suddha was certified in 1984 and is the Director of the Chicago Yoga Center. Initiated into Raja Yoga and Meditation in 1982 by Swami Narayanananda, his training includes classical Hatha, the Iyengar method, shtanga Yoga with Sri K. Pattabhi Jois in South India and Vinyasa Krama of Sri T. Krishnamacharya as taught by Srivatsa Ramaswami. Suddha has been an Adjunct Associate Professor at the School of the Art Institute of Chicago since 1989, and enjoys the art of photography. Due to limited space, early registration is encouraged.